Former FBI director, James COmey in a recent interview believed that the Russian government might have compromising information on U.S President Donald Trump. 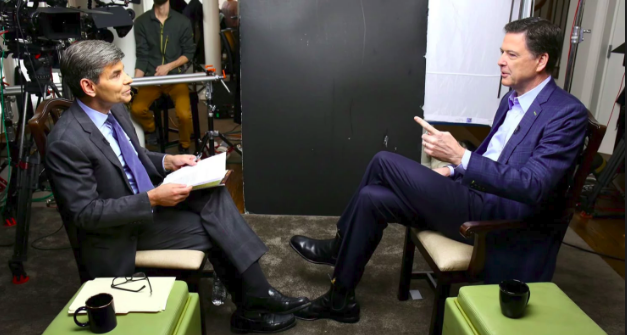 Comey in his interview said the various actions by the U.S President shows that there are “some evidence of obstruction of justice” in the president’s actions and that Trump is “morally unfit” for office. The former FBI director talked about his firing in May because he was looking into the election meddling by the Russians in the U.S. election, even though Trump has tweeted the investigation is a witch hunt, and himself or his team have no collusion with Russia. A person who sees moral equivalence in Charlottesville, who talks about and treats women like they’re pieces of meat, who lies constantly about matters big and small and insists the American people believe it — that person’s not fit to be president of the United States, on moral grounds. Attacking Comey before the interview, Trump denied he ever asked Comey for a loyalty pledge,but the firing of James Comey caused another scramble at the Justice department that led to Attorney-General Jeff Session recusing himself from the investigation, and the appointment of Robert Mueller, which had since led to the investigation of 19 people, and this include the Trump’s former campaign chairman, Paul Manafort and former National Security Adviser, Michael Flynn. Two campaign aides, Rick Gates and George Papadopoulos have pleaded guilty and are currently cooperating with Mueller. In few hours to his testimony in the US senate, James Comey has opening statement has been posted online. In that context, prior to the January 6 meeting, I discussed with the FBI's leadership team whether I should be prepared to assure President-Elect Trump that we were not investigating him personally. That was true; we did not have an open counter-intelligence case on him. We agreed I should do so if circumstances warranted. During our one-on-one meeting at Trump Tower, based on President Elect Trump's reaction to the briefing and without him directly asking the question, I offered that assurance. A few moments later, the President said, "I need loyalty, I expect loyalty." I didn't move, speak, or change my facial expression in any way during the awkward silence that followed. We simply looked at each other in silence. The conversation then moved on, but he returned to the subject near the end of our dinner. At one point, I explained why it was so important that the FBI and the Department of Justice be independent of the White House. I said it was a paradox: Throughout history, some Presidents have decided that because "problems" come from Justice, they should try to hold the Department close. But blurring those boundaries ultimately makes the problems worse by undermining public trust in the institutions and their work. Near the end of our dinner, the President returned to the subject of my job, saying he was very glad I wanted to stay, adding that he had heard great things about me from Jim Mattis, Jeff Sessions, and many others. He then said, "I need loyalty." I replied, "You will always get honesty from me." He paused and then said, "That's what I want, honest loyalty." I paused, and then said, "You will get that from me." As I wrote in the memo I created immediately after the dinner, it is possible we understood the phrase "honest loyalty" differently, but I decided it wouldn't be productive to push it further. The term -- honest loyalty -- had helped end a very awkward conversation and my explanations had made clear what he should expect. The FBI leadership team agreed with me that it was important not to infect the investigative team with the President's request, which we did not intend to abide. We also concluded that, given that it was a one-on-one conversation, there was nothing available to corroborate my account. We concluded it made little sense to report it to Attorney General Sessions, who we expected would likely recuse himself from involvement in Russia-related investigations. (He did so two weeks later.) The Deputy Attorney General's role was then filled in an acting capacity by a United States Attorney, who would also not be long in the role. After discussing the matter, we decided to keep it very closely held, resolving to figure out what to do with it down the road as our investigation progressed. The investigation moved ahead at full speed, with none of the investigative team members -- or the Department of Justice lawyers supporting them -- aware of the President's request. Shortly afterwards, I spoke with Attorney General Sessions in person to pass along the President's concerns about leaks. I took the opportunity to implore the Attorney General to prevent any future direct communication between the President and me. I told the AG that what had just happened -- him being asked to leave while the FBI Director, who reports to the AG, remained behind -- was inappropriate and should never happen. He did not reply. For the reasons discussed above, I did not mention that the President broached the FBI's potential investigation of General Flynn. 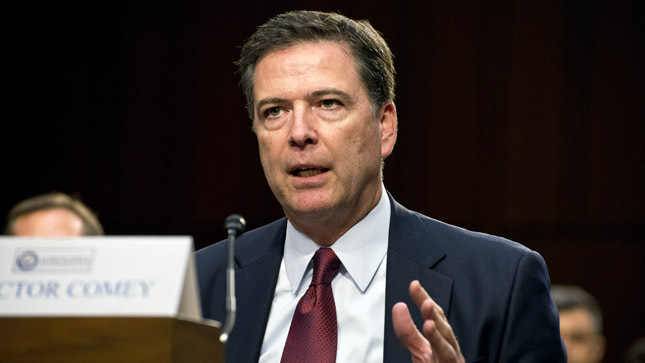 The FBI director, James Comey on Sunday had said that the killings that happened in Baltimore is not an act of terrorism. The FBI director said the shooting in Charleston, South Carolina that killed 9 people by a 21 year old Dylan Roof is not an act of terrorism, but a political motivation. James Comey said this on Friday while in Baltimore. 1. Dylan Roof killed 9 African Americans because he believes they are taking over the country. Do you think Dylan Roof is a terrorist, or is FBI Director right?